Our Philosophy: To Provide Superior Medical Care In A Pleasant & Comfortable Environment. Nurse practitioners are registered nurses with additional training that enables them to provide primary or subspecialized health care services. What procedure should I expect at my first office visit? No procedures are done during the first visit. The initial visit is used as an opportunity for the doctor to talk with you and to conduct an examiniation. If a subsequent procedure is needed, it will be discussed during the visit. Are all of the physicians Board Certified? Yes, all of our physicians are board certified. What do the letters F.A.C.G. stand for? Fellow of the American College of Gastroenterology. These letters are added to the doctor’s name based on certain criteria and number of years in practice. It does not reflect board certification. Can I have my procedure performed at your office? 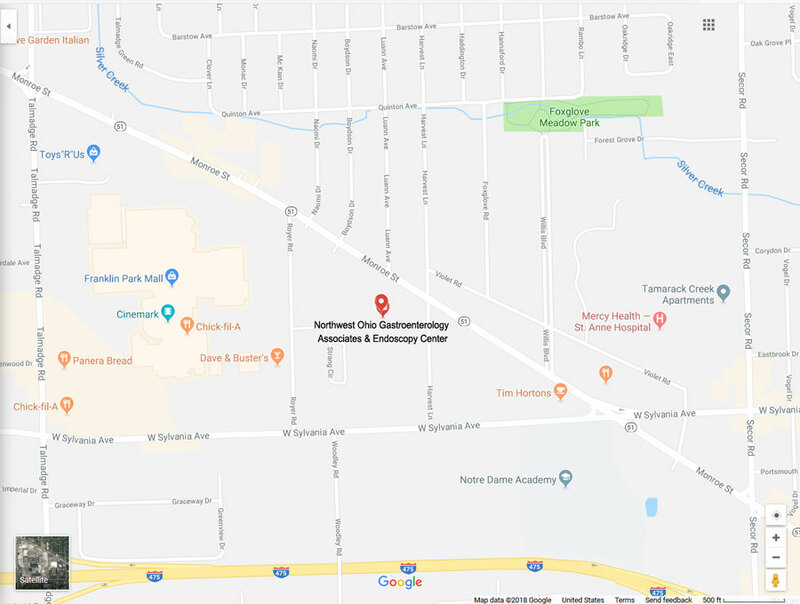 Upper endoscopy and colonoscopy can be safely performed at Northwest Ohio Endoscopy Center. If your insurance company will not cover these procedures to be done at our center, they will be scheduled on an outpatient basis at one of the local hospitals. What is the difference between a MD and a DO? There are two kinds of physicians in America, Doctor of Osteopathy (DO) and Doctor of Medicine (MD). Both complete nearly identical preprofessional and professional training; both have demonstrated competency in clinical situations; and both are licensed to practice medicine. Although many DOs practice in a primary care environment, our doctors specialize in diseases of the digestive system and liver. To release your medical records, we need a signed consent form that includes your name, your doctor’s name, and the address where the records need to be sent. All of the listed referring physicians will automatically receive your information. 7:30 a.m. to 4:30 p.m., Monday through Friday. How do I reach my physician in an after-hours emergency? On weekdays after 4:30 p.m., as well as on weekends and holidays, you can reach the on-call physician at (419) 887-5300. You will need to bring your insurance cards and a list of all medications. Please have all of your registration forms filled out before arriving at the office. It is your responsibility to ensure that our office has received a referral from your Primary Care Physician, if one is needed. If you are unsure if a referral is needed, contact your insurance company. If this is a follow up visit, please make us aware of any changes in medications. Why am I receiving two (2) bills? One statement is from the physicians who performed your procedure and the second statement is from the facility where the procedure was performed. You may receive a third statement, from a lab, if a biopsy (tissue sample) was performed at the time of your procedure. David L. Zack, D.O., F.A.C.G.